There's not much between Auckland and Hamilton but a lot of road walking and a lot of muddy, swampy, overgrown trail. But there were a few oases: the odd, but extremely welcoming Podge's Place in a small town called Mercer and the Rangiriri Pie Shop with giant homemade meat pies. (Meat pies are not common in the states, but they're everywhere here and we've come to love them as a town-day delicacy). And this is how the blogs get written. Podge's Place is quite possibly the strangest bar I've ever entered, but they let hikers camp for free in the backyard and charge $10 NZD (~$7 USD) for a hiker-sized burger and fries. They also have free showers and free WiFi, which is hard to come by here. Definitely worth a stop! We were looking forward to a visit with friends in Hamilton as we walked south along the highway. We texted Michael to let him know we'd arrive the next day and he offered to pick us up that night. It's easy to forget how slowly we move on foot (and how circuitous our routes can be) -- he was only 20 minutes away by car. Michael kindly agreed to give us another shuttle so we could slackpack the section between Huntly and Hamilton the next day. The "trail" out of Hamilton was a beautiful city bike path along the Waikato River. Walking on pavement is never ideal, but the scenery was lovely and the miles went by quickly. Along the Te Awa River Ride. 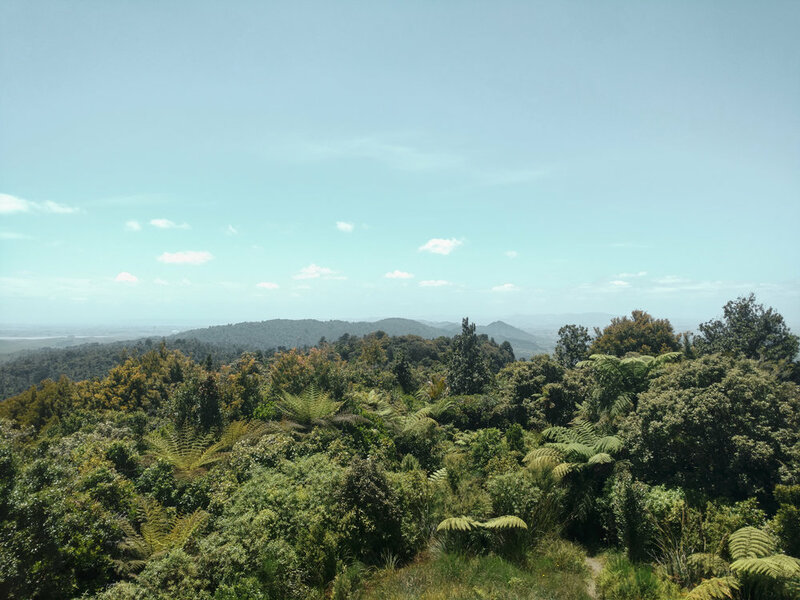 After a quick stop for fried chicken and chips (fries, of course), we headed up toward the Hakarimata Summit. And I mean straight up. The trails here are generally either insanely rough or insanely built up. This giant staircase was nearly a mile long and climbed over 1000ft. After a 40km hike (~25 miles), the nicest thing in the world is to be picked up and brought home for showers and home cooked dinner. Amazing! But to make this even nicer, we made a quick stop on the way home: we picked up a car that Michael offered up for an impromptu adventure. Road trip! Jonathan learns the basics of righthand drive. Go ahead, just try to do it without turning on the windshield wipers instead of the turn signals. Just try. Michael also offered up two mountain bikes, and we could hardly believe our luck. Who would say no to that?! We'd never mountain biked before, but we were both stoked for the challenge. He sent us straight to Rotorua, an area that's famous for it's volcanic activity in addition to it's world class bike park. Much like Yellowstone, Rotorua has heated pools, boiling mud, and even geysers. 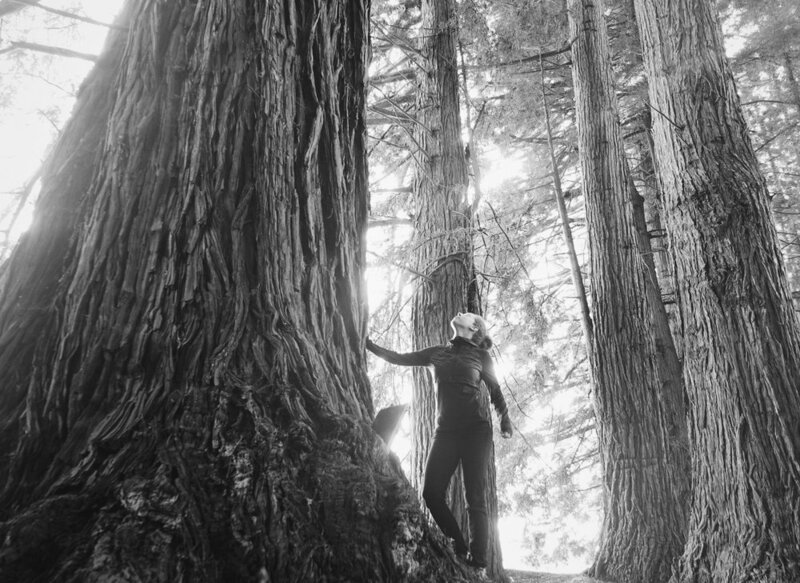 It also has groves of California Redwoods that were planted there a hundred years ago. We got up the next morning and headed straight for the trails. Other than a quick break for our scenic picnic lunch, we biked until our hands were cramping and all we could think about was our next meal. Sweaty and dusty, we rode back to the car to plot our next move. 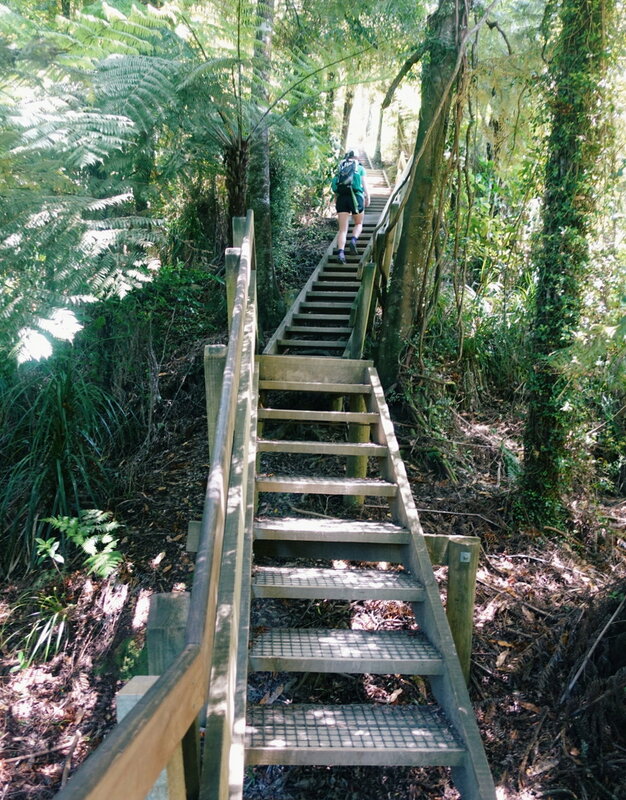 If you ever go to Rotorua on a budget, there are a lot of attractions that are really (really!) pricey. But just south of the bike park, we found a free way to revel in Rotorua's thermal resources. We stayed the night in Rotorua before heading back to Hamilton the next day to see Amy, who was just arriving back from a trip to Cambodia. We ate a luxurious breakfast in town and then took a brief detour to Hanurama Springs on our return journey for one last stroll through the redwoods. Jonathan staring down into the 45 ft deep Te Puna-a-Hangarua at Hanurama Springs (more info here). After 3 glorious days, it wasn't easy to pack up and leave. The only critical thing we forgot? Well, we never took a single picture with Michael and Amy. Means we'll just have to go back to visit again! Thank you so, so much to Michael and Amy for all of your amazing support and for sharing our stoke for adventure.